European Individual Women Chess Championship 2011 in Georgia? The ECU President Silvio Danailov is in Tbilisi (Georgia). The visit is part of his mini European tour and might have a decisive role in the selection of venue for the Women European Individual Chess Championship 2011. 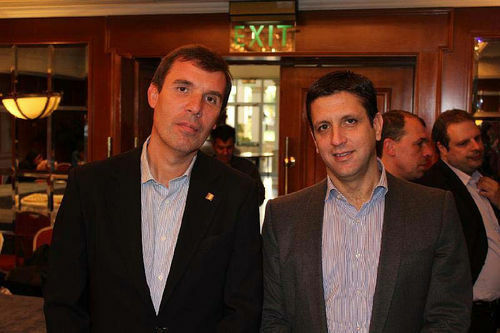 The Turkish Chess Federation decided not to organize EIWCC after disagreement with ECU in the end of 2010. The ECU opened a new bidding procedure and Georgia is one of the countries that has submitted an applicction. An official communication by the Ministry of Sports and Youth Affairs of Georgia claims to have high hopes of organizing the European Championship there. The proposed dates of the event are 7-25 May, 2011. Right before going to Georgia, Silvio Danailov visited Cyprus after invitation by the Cyprus Chess Federation. The hosts were the President of the Cyprus Chess Federation Mr. Christoforos Tornaritis and the Secretary General Mr. Paris Klerides. 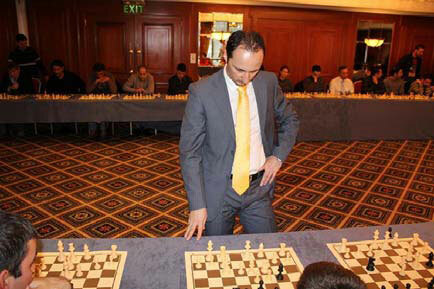 Veselin Topalov was also present in Cyprus and was the main topic for the media there. A simul was organized, photo below.